Problem solving and decision-making are important skills for business and day today life. Problem-solving often involves decision-making, and decision-making is especially important for management and leadership. There are different tools and techniques to improve decision-making and improve the quality of decisions. However, decision-making is more natural to certain personalities, so such people are focusing more on improving the quality of their decisions. People who are less natural decision-makers are often able to make quality assessments, but then need to be more decisive in acting upon the assessments made. Problem-solving and decision-making are closely linked, and each requires creativity in identifying and developing options, for which the decision making techniques are particularly useful. Good decision-making requires a mixture of skills: creative development and identification of options, clarity of judgement, firmness of decision, and effective implementation. To fulfil all above requirements, availability of factual data is very important as decisions based on factual data has proven to be highly successful and effective. Therefore, it is important to understand what data is required to gather and how to analyse and identify factors affecting the problems in order to make effective decisions or device solutions. Check sheet is one of the highly proven technique that is commonly used in every sphere of decision making. Following types of Check sheets have been extensively used by highly successful managers to make effective decisions. a. Production process distribution check sheets. b. Defective item check sheets. c. Defect Location check sheets. d. Defect cause check sheets. e. Check-up confirmation check sheets. The management faces with many kinds of problems in the day to day running of a business or an industry. For proper solution of such problems correct decisions have to be made. Decisions based on correct factual data rather than on mere opinions have proved to be correct most of the time. If data is to be collected, it is essential to make the purpose clear and to have data, which clearly reflect the facts. 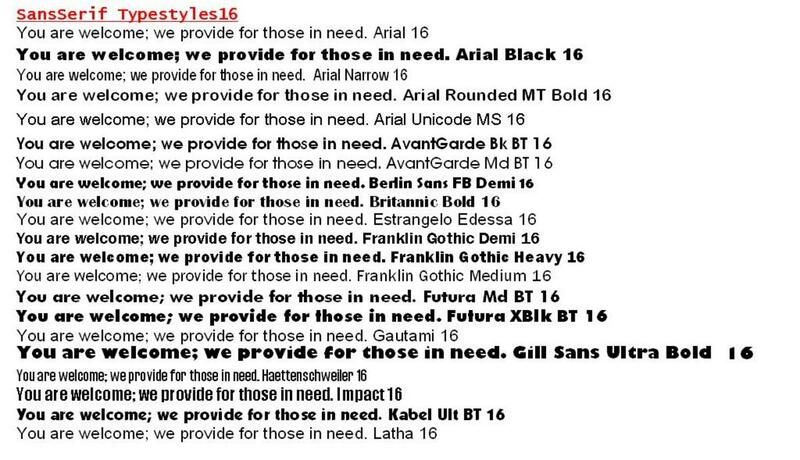 It is also important that data is gathered in a simple way and in an easy-to-use form. A Check Sheet, which is a format used as an aid in assembling, compiling and analysing data, could be used in problem solving. Further, check sheet is another simple and effective tool useful in Lean Six Sigma projects. It is sometimes referred to as a concentration diagram or location plot. It is a handy tool for both qualitative and quantitative data gathering and analysis. Check sheets help to systematically collect and organize data and is useful in the all phases of the Lean Six Sigma DMAIC (Define, Measure, Analyse, Improve and Control) framework. Data collection can often be an unstructured and messy exercise. A check sheet is a simple form you can use to collect data in an organized manner and easily convert it into readily useful information. Data collection is important, because it is the starting point for statistical analysis. The function of a check sheet is to present information in an efficient, graphical format. A defining characteristic of a check sheet is that data is recorded by making marks ("checks") on it. The check marks show how many times each particular value occurs, with the information collected becoming increasingly helpful as more data are collected. Main applications of a check sheet include registering how often different problems occur and registering the frequency of incidents that are believed to cause problems. a. Effective way of displaying data. c. Can identify the root cause of a problem. d. A first step in the construction of other graphical tools. e. Provides a structure for uniform data collection. f. Can be used to substantiate or refute allegations. When to use the check sheets? Using a check sheet is appropriate when the data can be observed and collected repeatedly by either the same person or the same location. It is also an effective tool when collecting data on frequency and identifying patterns of events, problems, defects, and defect location, and for identifying defect causes. For an example, check sheets are used to collect data on products coming out from production line in a factory to identify the defects. Check sheet is designed to mark identified deferent defects in a particular product. The use has a simple task of observing or inspecting the product and mark the defects using check marks in the check sheet. Check sheets also could be used for service oriented processes. For example, a check sheet could be designed to record different type of customer complaints reporting for a specific time period. Also, it can be designed to record difficulties encountered by customers in a shop or mall during retail shopping. 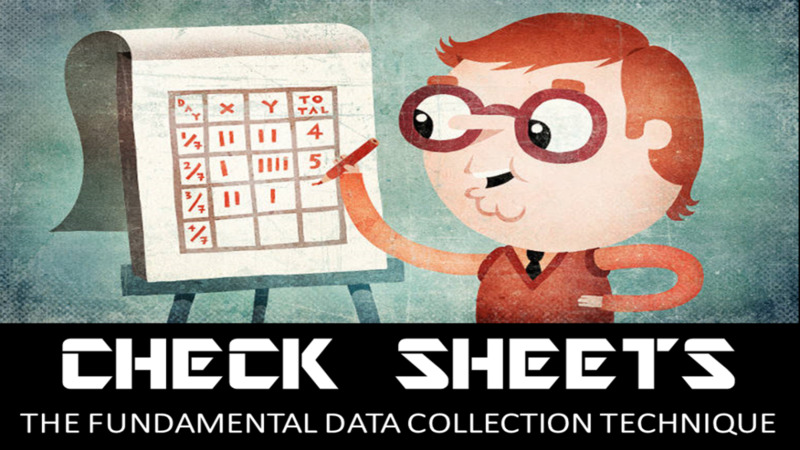 So, check sheets could be applied to different data collection requirements in various situations. A production process distribution check sheet is used to collect data about the extent of variation in a production process. For such an analysis usually a histogram is used. However, when preparing a histogram, to collect a great deal of data and then make a frequency distribution table from these data is a tedious task. In a production process if the individual values are not of major importance and it is sufficient to ascertain the form of the distribution and the relationship to the specification limits, the above mentioned type of check sheet could be used. Figure 1 is an example for a production process distribution check sheet, which can be prepared in advance. A cross (x) or a tally mark is put in an appropriate box each time a measurement is made so that the distribution pattern is ready when the measurements are finished. The person collecting the data must be careful not to forget to make any check marks or not to make any incorrect check marks as mis-checks are almost impossible to discover later. When the machines, materials or workers differ – that is, when the conditions influencing the data differ – it is best to use a separate check sheet each time and to compare them later. When using a single check sheet for different data sources it is better to use different colours or marks. Once the check sheet is complete examine the distribution pattern for the following. a. Does the distribution assume the shape of a bell, i.e. single-peaked and neat, or are there two peaks? Are the values skewed to one side and are there any isolated values? b. Check the relationship existing between the actual distribution and the specification limits. Is the centre of the distribution close to that of the specification limits? Is the width of the distribution greater than the specification limits? 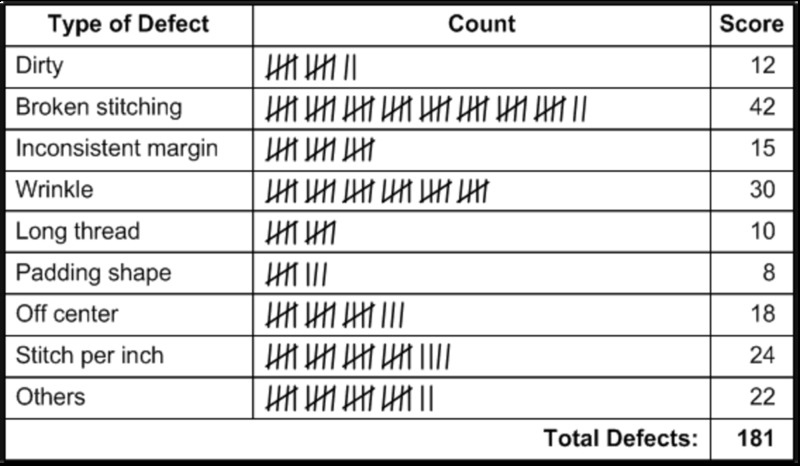 In order to reduce the number of defectives it is necessary to know the kind of defects and their percentages. Since different defects have different causes, it is of no use just to list the total number of defects. The defects and their frequencies must be recorded and appropriate action should be taken to eliminate the defects starting with that having the highest frequency. An example of a defective item check sheet is given in Figure 2. External defects such as scratches, scars, spots of dirt are found on many kinds of products and various are being made at many plants to reduce these defects. The defect location check sheet is very useful in solving this kind of problem. 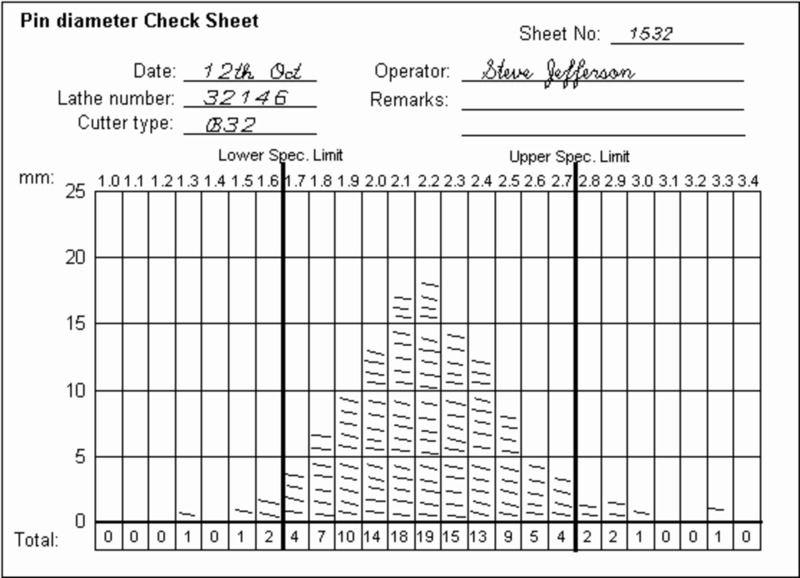 Generally, many check sheets of this type have sketches or expanded views on which markings are made so that the distribution of defect occurrence can be observed. 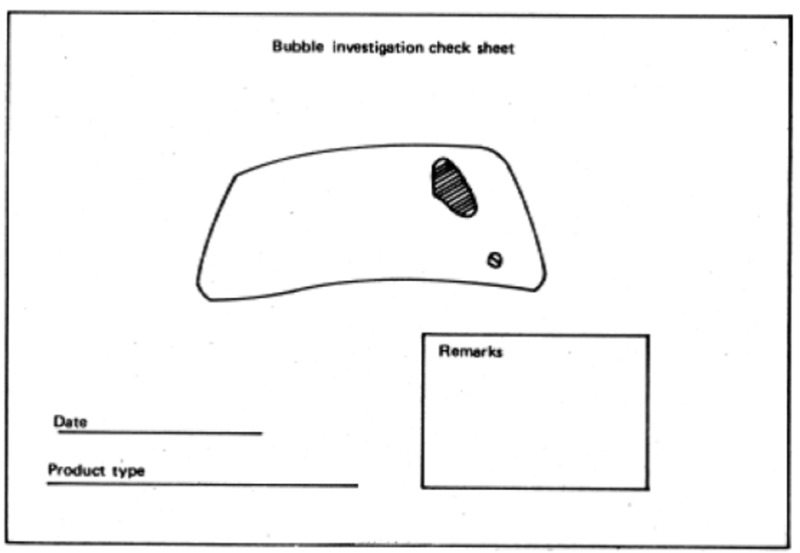 Figure 3 is a check sheet used to examine bubbles in a laminated automobile windshield glass. The location and form of bubbles was indicated on the check sheet and it was found that most of the bubbles were on the right side. On investigation it was discovered that the pressure used in laminating was out of balance – the right side receiving less pressure. The machine was adjusted and the formation of bubbles was eliminated almost completely. This check sheet easily leads to action and is indispensable for process diagnosis because the causes of defects can be often found by examining the places where defects occur and carefully observing the process to determine why defects become concentrated in these places. For example, when you rent a car, you probably receive a document with the sketch of the car which allows you to circle any damages, dents or scratches on the car with a corresponding mark on the diagram. This is an example of the location diagram. Some of the check sheets mentioned earlier are used to find out the percentages of various types of defects and their location. But this check sheet helps to precede a step further in detecting the causes for these defects by making use of stratification. Figure 4 is a defect cause check sheet for recording defect occurrences in Bakelite knobs with regard to machines, workers days and types of defects. At a glance it can be seen that Worker B has produced a lot of defects and on Wednesday all workers produced many defects. 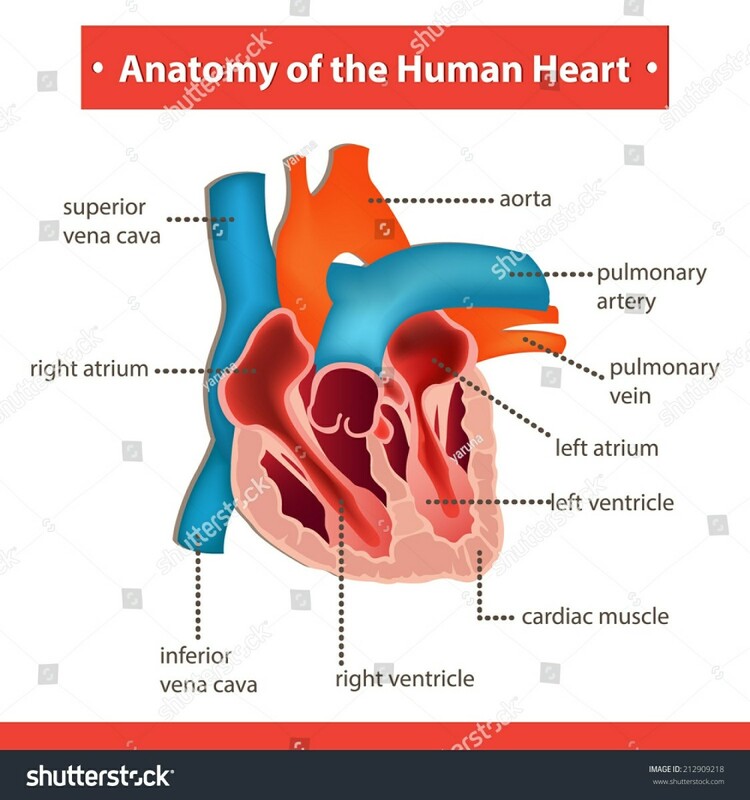 Upon investigation, it was revealed that Worker B has not changed dies often enough and on Wednesday a raw material composition, which was more likely to cause defects, had been used. This type of check sheet is used to keep a record of operations performed to make sure that nothing is overlooked. It has application where the list of operations is long and/or complex. All the tests/operations/items are listed beforehand on the check sheet and a mark is made for each item as you proceed with the check-up. 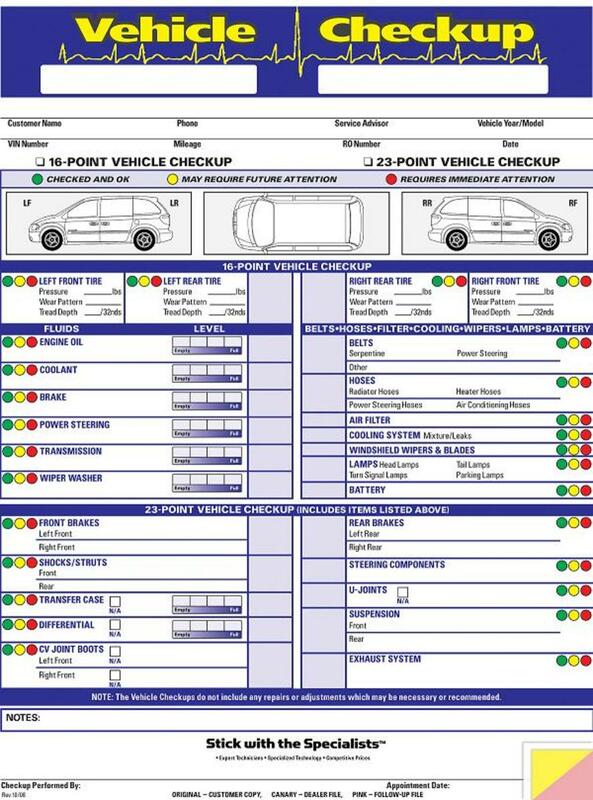 Figure 5 shows a check sheet used in a Vehicle Check-up, checking and finishing all the work that has already been done throughout the maintenance process. • Clearly define what events (problem or process) are to be recorded. (Add a category of other to capture incidents not easily categorized into any of the specified groups. • Define the period for data recording and suitable intervals. The time period should be representative (that is, a one day sample on Monday may not be representative of a typical day). • Design the check sheet to be used during data recording, allocating space for recording, and for summarizing within the intervals and the entire recording period. 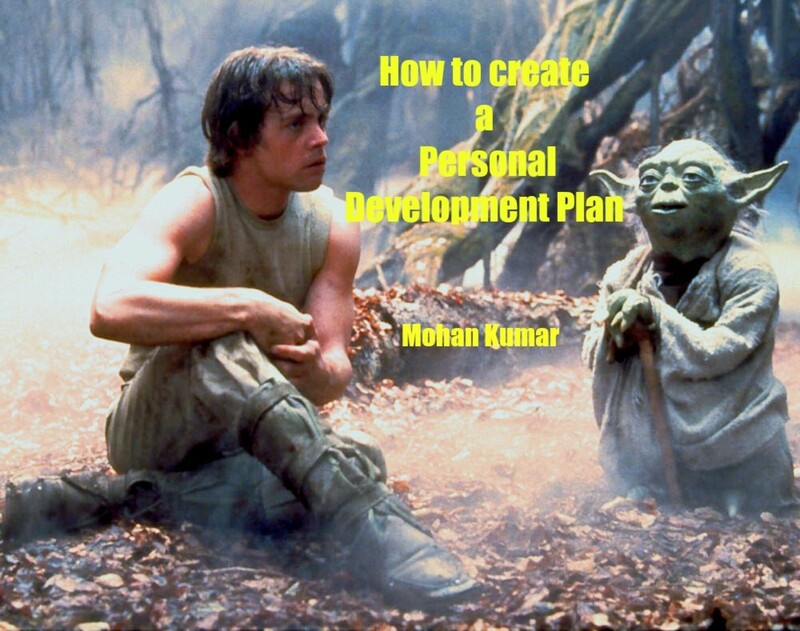 • Develop a check sheet that is easy to understand. All columns should be clearly labelled. • Perform the data collection during the agreed period, ensuring that everyone understands the tasks and the events to be recorded. • Analyse the data to identify events with unusually high or low occurrences. • Train all those involved on gathering data. A uniform data collection technique is vital. • Plot the information on a check sheet.